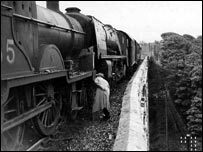 The stretch of railway track at Grayrigg in Cumbria, where a woman died in a high-speed derailment, was the scene of another crash - 60 years ago. In May 1947, a 13-carriage Glasgow to London express failed to stop at signals and collided with a locomotive. Then, three people were seriously hurt and another 30 required treatment. But in 1947, the train was allowed to finish its journey after three hours and 120 yards (110m) of new track was replaced in just 15 hours. Railway historian Peter Robinson says the rail infrastructure today is very different from that in 1947. But he says while the circumstances of the two incidents are different, the location is virtually identical. At 1407 GMT on 18 May, 1947, the 1000 GMT Glasgow to Euston express should have slowed down at signals because of engineering works on the line between Grayrigg and Oxenholme. But the driver of the express failed to see the signals and ploughed into a stationary engine on the Docker viaduct, just a few yards from where the Virgin Trains pendolino derailed on 21 February. The engine and three leading coaches of the express were derailed. It later emerged the driver was trying to get his handkerchief out of his bait box. 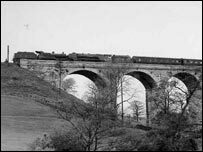 Mr Robinson said: "Just like the recent incident, the 1947 accident could have been so much worse, with one or both of the trains going over the viaduct. "Fortunately the driver of the other loco was able to reverse a short distance to lessen the impact." The accident report of the time stated: "The collision was solely due to the driver's inattention. He stated quite simply that he forgot the signals. "It is to his credit that he attempted no excuses, but it is the primary duty, of a driver, in the exercise of his profession, to avoid forgetfulness of this kind. "After reviewing all the circumstances, this driver may be unfitted temperamentally for the responsibilities of main line work." In contrast the driver of the train in the latest incident, Iain Black, was hailed a hero for staying at the controls after it derailed. Mr Robinson added that the 1947 also resulted in more structural damage to the carriages, many of which were made of wood. He said: "Much of the insides of the carriages were damaged by the impact, with seats being displaced. "It was common in incidents like this for timber carriages to telescope into one another, causing very serious injuries to passengers inside." The investigation into the latest crash continues.